„Crime does not pay!“ Bernd Klose and the international experts of FraudNet deliver necessary knowledge for tracing & recovering assets worldwide. 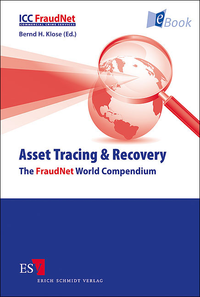 They show the basics of asset tracing and recovery in common law and civil law, respective national laws, regulations and proceedings of over 40 countries, an introduction of fraudulent techniques and international available remedies. A special focus on offshore activities allows you to recover deprived assets without the legal enforcement agencies. With the country specific data accessible on the internet, the Compendium proves to be a practical work of reference for your daily fight against fraud. Als gedrucktes Werk mit dem Titel Asset Tracing & Recovery erschienen.